Ukrainian oligarch Igor Kolomoysky has allegedly threatened to send volunteer battalions from eastern Ukraine to Kiev to seize a leading energy firm and power plant. The ex-governor’s gamble comes after one of the companies was shut for non-payment. The audio recording of a conversation, in which a man sounding like Kolomoysky, the former Dnepropetrovsk governor fired by President Petro Poroshenko at the weekend, is heard voicing threats to the head of Naftogaz, has been posted by Ukrainian journalist-turned-MP Sergey Leshchenko on his Facebook page. Kolomoysky tells Naftogaz chief Andrey Kobolev that he is not going to pay the debts "as a matter of principle." “We will not pay with a gun to our temple, you hear me?” he tells Kobolev in the alleged conversation. “If you move the valve, give the command, we will take over this plant and the case is over,” Kolomoysky warns. “And if you *** [show off], we’ll grab your Tsentrogaz or as it’s called Transgas [apparently meaning Ukrtransgaz]. We can transfer people to Kiev from the ATO area,” he adds, referring to the Kiev government’s so-called “anti-terrorist operation” in eastern Ukraine. Kolomoysky concludes: "No need to experiment with your own country." It was not immediately clear when the alleged conversation had taken place. Late Wednesday last week, Poroshenko signed a decree firing Kolomoysky as Dnepropetrovsk governor. According to the presidential website, Kolomoysky decided to hand in his resignation, which the president accepted. “Such behavior was not just a slap in the face to the legitimate authorities. It was a kick in the teeth to a country that has gone through the Maidan. And Kolomoysky’s dismissal is the weakest punishment that he could bear," Leshchenko wrote on his Facebook page, referring to Kolomoysky's threats. Earlier, media speculated about the threats posed by the oligarch to Kiev after Kolomoysky reportedly talked about the possibility of separatist uprisings in Dnepropetrovsk. “I don’t want that... but anything can happen,” Kolomoysky told France 24 TV. The conflict involving Kolomoysky, who is worth $1.3 billion according to Forbes, erupted after the Ukrainian parliament, the Verkhovna Rada, passed a law last week stipulating that the state could manage any company in which it has a majority share. Kolomoysky’s companies own about 43 percent of Ukrnafta, the country’s biggest oil company, with the government controlling over half of its shares. According to previous legislation, the state needed 60 percent ownership to exercise active control over a part-private company, which meant that Kolomoysky could block any government decision within the company, including withholding dividends from the state and preventing quorums at board meetings. However, after the government fired Kolomoysky’s protégé from Ukrtransnafta (an energy company in which the oligarch also has a stake) the oligarch occupied its office with armed masked men on Friday, accusing the government of being “Russian saboteurs” and “corporate raiders.” He also reportedly threatened to “bring 2,000 volunteer fighters to Kiev” before being persuaded to stand down. Then on Sunday, fighters of the Dnepr-1 battalion, funded by Kolomoysky, took control of Ukrnafta’s central Kiev offices. Over the past year, Kolomoysky, who is committed to protecting Ukraine's territorial integrity, has reportedly financed volunteer battalions waging war against the eastern Ukrainian rebel militias. It's believed Kolomoysky still retains considerable sway over them. The head of the Ukraine’s Security Service, the SBU, demanded that Kolomoysky be prosecuted for seizing Ukrnafta. On Monday, SBU chief Valentyn Nalyvaychenko said that representatives of the Dnepropetrovsk regional administration may have been involved in gang activity, and be responsible for a number of kidnappings and killings in the area, including the recent murder of an SBU officer in Volnovakha near Donetsk. 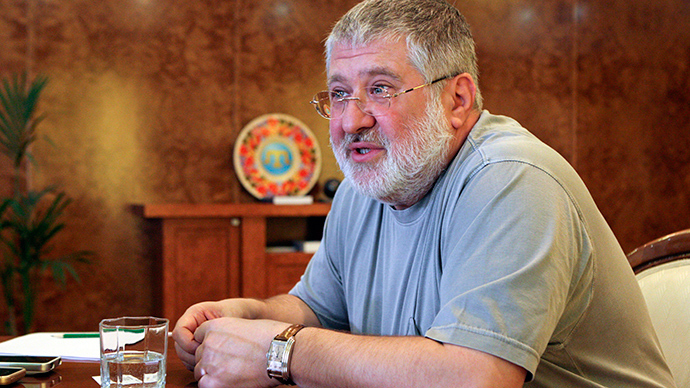 "Kolomoysky has, as some put it, 'an atomic bomb' - PrivatBank. Problems with it may simply bury the entire financial system of Ukraine. It is a system-based bank,” the co-chairman of the Kiev Center for Energy Strategies, Dmitry Marunych, told RIA Novosti news agency. “If it Kolomoysky uses it, I do not even want to calculate the consequences for the state," he added. Bogdan Bezpalko, deputy director of the Center for Ukrainian Studies and Belarus studies at Moscow State University, said Kolomoysky can very quickly change his political positions. "At first he expressed support for the unitary character of Ukraine, created the destroyer battalions which he directed against the DPR and LPR. And now, all of a sudden, he started talking about decentralization, federalization, suddenly a 'popular assembly' gathers in Dnepropetrovsk.” He is now trying to play on the same trends that the Donetsk and Lugansk People’s republics used a year ago to build their own state,” Bezpalko told RIA Novosti.